Your NCLEX test date can creep up on you. It seems so far away and then….PANIC…it’s right around the corner. The earlier you begin studying, the less overwhelmed you’ll feel. Start small by buying a review book and trying out a few questions each day. Download iTube App Familiarizing yourself with the style and content of questions will help you figure out where you need to spend the bulk of your time when you really get into study mode. It takes a few weeks for something to become habit. 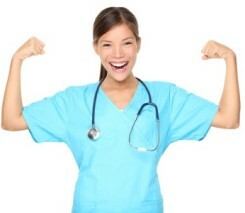 Make NCLEX studying part of your daily schedule. Spend the same time each day and if possible, in a specific study spot. Having a regimen will give you a greater chance that you’ll stick with it. Review classes are worth it. Where else are you going to find someone who will condense an enormous amount of material into a need-to-know review book? When else would you sit in a room for eight hours doing nothing but NCLEX review? Nowhere! Review classes are worth the money. There’s no doubt the NCLEX has a distinct question format. In many cases, it’s more important that you catch on to how they want you to think things through than that you know all of the content. Sometimes you can go the other extreme, though—thinking into things too much can actually confuse you. The only way to find the balance is to do as many questions in advance as you can find. Your scores really will improve with time. No matter what you do to prepare, sitting at that test station on the day of your NCLEX exam is completely anxiety provoking! “How many questions will I have? When will it shut off? I have no idea what the right answer is!” One of the best things you can do is stop every few questions to take a few deep breaths. You can’t do your best thinking in that worked up state. Make deep breathing part of your NCLEX review practice so that it’s second nature by the time you’re up at bat.